Next up for kitty bootcamp was a gorgeous shy little fellow named Scooby. A striking black and white boy, he was quite nervous around strangers, though he quickly came to enjoy cuddles and chin scratches. With the nervy ones, there is always extra time and patience required to bring them along, but it is also extra rewarding when you get the first tentative tail wag or nose touch! 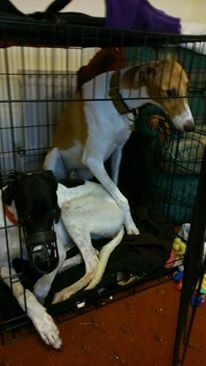 Scooby and Ru were excellent foster brothers, playful and silly, even though Ru can be a bit grumpy when it comes to “his” bed or sofa! On walks together they did tend to make each other more nervy, as Ru is still very wary of strangers, so each would wear both a harness and collar, meaning I had four leashes in total, quite a handful! With very little interest in the cats, Scooby made quick progress through kitty bootcamp. He would avoid eye contact with them and only have an occasional sniff when they came around. 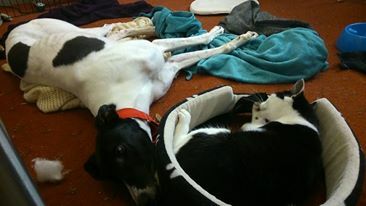 He could also be often found nappy in proximity to Pea, who seemed to take special interest in him for his matching black and white outfit! 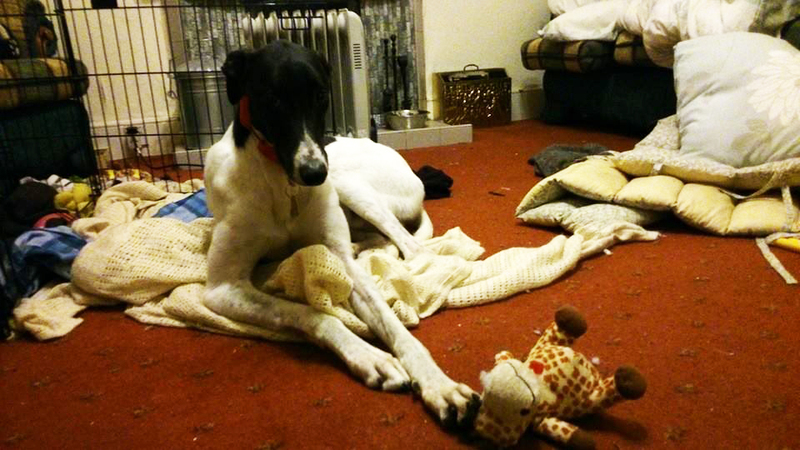 Scooby has gone to a lovely home with a family including children and two cats. Still shy at first, he has made great progress and comes more out of his shell every day. I delivered him to his family in Mullingar on my way to Dublin for the Pet Expo where HUG had a stand to meet and greet with the public. Pet Expo was well attended with a busy crowd of people and dogs. 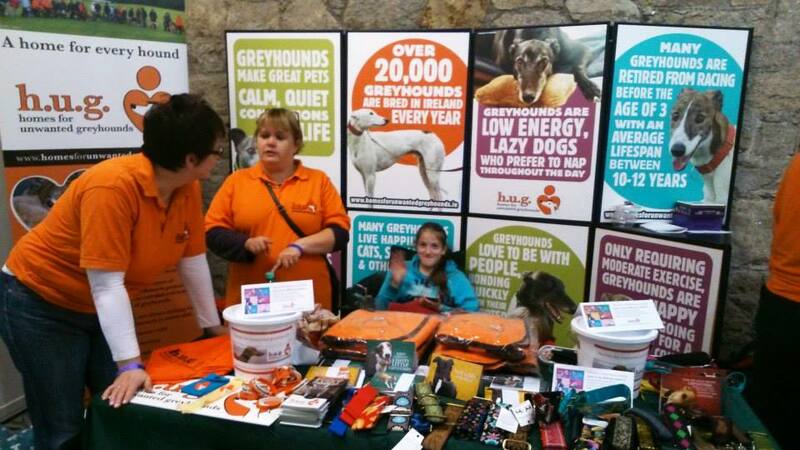 Our new display stands worked out well and we sold quite a few Christmas cards as a fundraiser, along with other HUG merchandise and hound gear. Exhibitors included representatives from multiple pet feed companies, pet shops, and rescue groups, as well as numerous dog breed clubs and enthusiasts. While dogs were the majority, there were also stands featuring birds of prey, donkeys, reptiles, rats, rabbits and a few cats. One positive sign was the number of people who were very complimentary about greyhounds, with comments like “I’ve heard they make great pets” or “I know someone who adopted one as a pet”. This is significant progress from a few years ago, as we were more likely to hear “why would you want a greyhound as a pet?”. 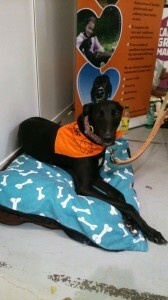 The largest shift in attitude has centered around the Dublin area, where it is far more common to see greyhounds, sighthounds and lurchers as pets these days. Now we’re hoping that the influence can spread to the rest of the country, especially rural areas where greyhounds are still not considered appropriate pet dogs. 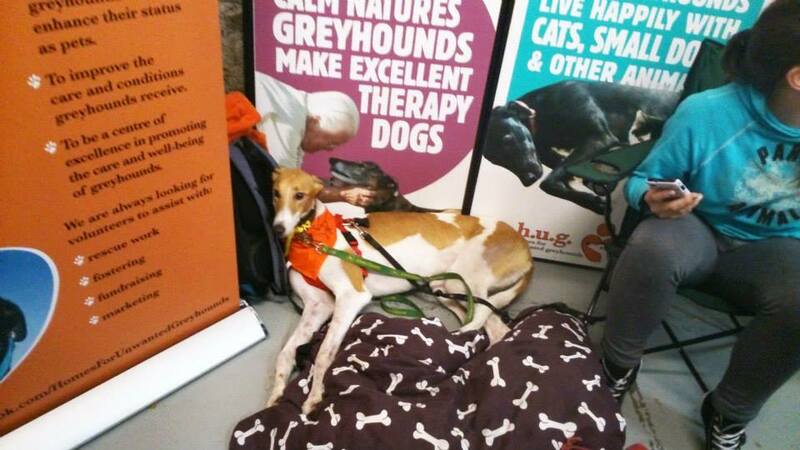 Ru helped out at the stand as well, though he’s still nervous of strangers, especially male strangers, he hung out at the back of the display, demonstrating the normal greyhound sleeping position.